I see a lot of people that I see around me, trying to grab old videogame systems for cheap then turn a huge profit on them, or people who swooning how good 8-bit graphics are and downputting most 3D games. I never did and don’t get the hype about those old games; and it isn’t a generation gap, it I wasn’t brought up playing these games. My parents greatly frowned upon most if not all forms of gaming. Computer games heavily as they owned computers (I didn’t own my first system till I was 16 or 17). Video game systems so much more. All my cousins had SNES or NES systems. Gameboys, even. I remember when the Gameboy classic had come out, they were in a big wireframe bargain bin in Big Lots, the Gameboys themselves in plastic packaging. Each sold about $40, I believe. I remember asking my parents to buy one, and they had told me that if I wanted one, that I’d have to get it myself (I was about 10 at the time). I only got about $1 a month, and things like doing chores or trying to work in the house for extra didn’t work. When I got about $20, I had asked my mom for the remainder as six months had passed by and the bin was getting empty. They refused, citing something about “video games being corrupting”. By the time I had about $30, the bin was empty and I didn’t see anything “affordable”. 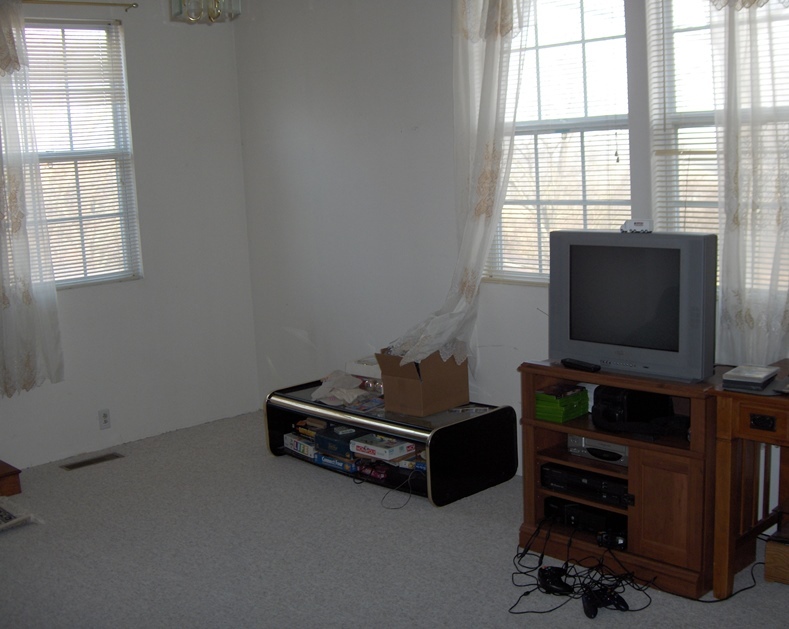 All those years later as I got more money, parents kept refusing to buy video game systems up to 2001. My uncle bought my an N64, which was on discount because they were starting to phase it out. And it had Pokemon stadium! Dad did not like this one bit, returning it to the store the very next day. Another time our only family computer had a hard drive crash. But my family took forever to try to fix it because “they didn’t want us playing on the computer all the time.” When they had gotten around to it the PC was beyond repair. They offered to buy a regular PSX to replace it. I believe the general consensus was to opt for a hard drive instead as it could do more things. Long story short, my family has always been pre-dispositioned against videogames, despite my apparent curiosity, fascination and want to play them. It’s not like I was going to suddenly spend all my time doing that. But my parents were rather strict and so that was my life. So my first videogame experience of owning a system was in the holidays of 2005. I had just started college, swiping a used Xbox off of my cousin’s friend for $80. A coworker had given me Halo and Halo 2 for free out of good will (great guy, had a few shenanigans together). 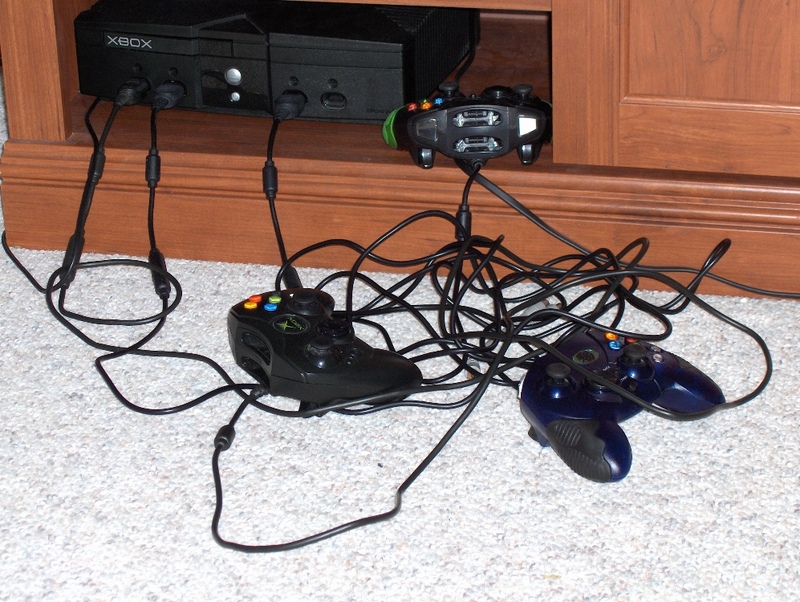 When that system sat underneath my TV Thanksgiving weekend, I played Halo almost all day. I barely got to play during the weekdays, so weekends were my catch-up days. I remember when I got my brother to sit down and we did campaign co-op. It was a different feeling, no longer competing or squabbling over things. I also felt completed, that I finally was able to own a video game system. 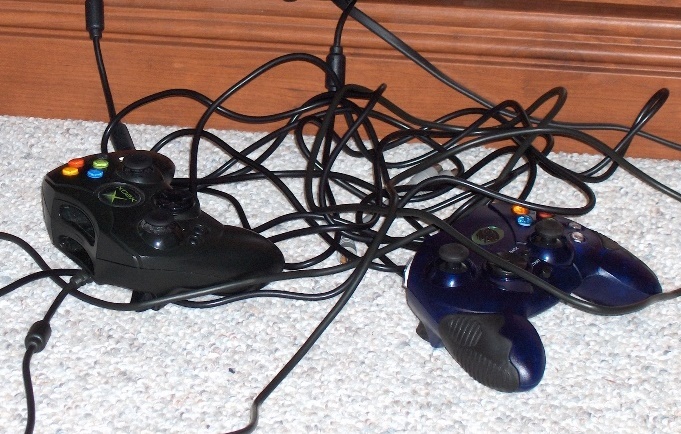 This was where my Xbox was set up. As you can see, I already had a good collection of games for the system already. My pride and joy, my Xbox. Only came with one factory controller, the rest were aftermarket accessories. There would be struggle still afterwards; my parents thought that Halo was overtly violent and my mother would blame my gameplay to giving my dad “migraine attacks”. But as time went on they left me alone about it. Up to this day that system is the one I have the most games on (about 30), compared to my Wii or my brother’s 360 Elite. It’s also the only system that I own 4 controllers for. I had gone all out to upgrade and try to stock it with things I like; now that its prime time is gone, I’m glad that I have all those accessories and games to go with it. As of now it sits in a storage box with the rest of my college belongings after having graduated from ETSU, but its one of my most memorable gaming systems that I have ever owned. So I have a different outlook with “the game that touched me” when I first started in the gaming world. Master Chief running around on Halo was my first experience. Using Kasumi to beat up Tina followed closely behind. And hopping in a Mad Cat and chasing down the Word of Blake occupied me for quite a bit.